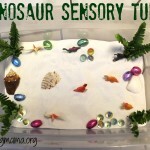 We did a sensory activity and made a swamp for our dinosaurs. 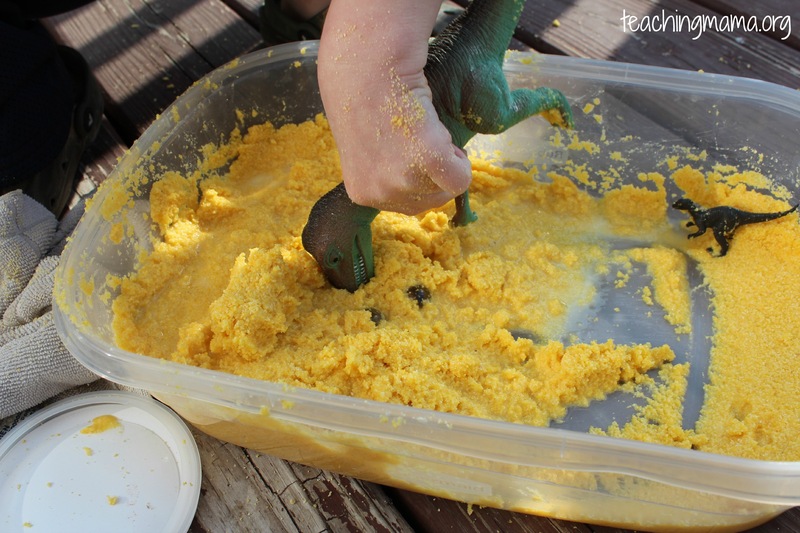 To make the swamp, we just mixed cornmeal with water. We thought the swamp felt slimy, grainy, and squishy. Then we added dinosaurs to our swamp. This was great for imaginary play. 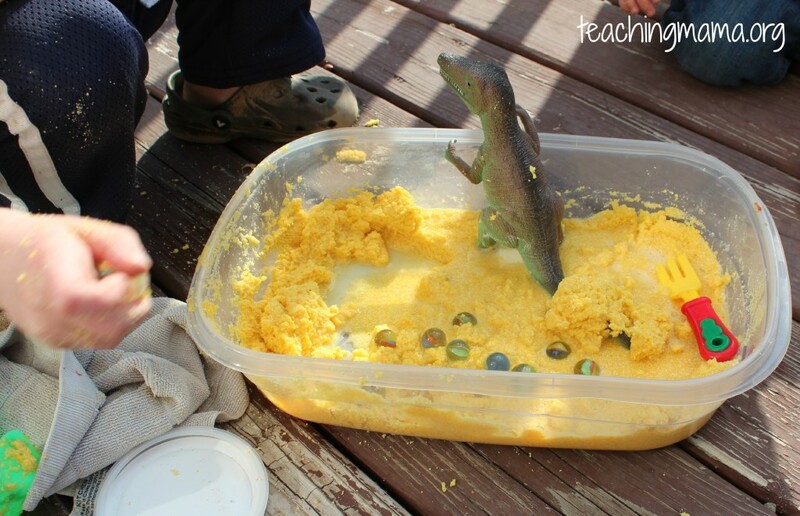 In our swamp, the big dinosaur was trying to find the hidden dino eggs (marbles) and baby dinos. 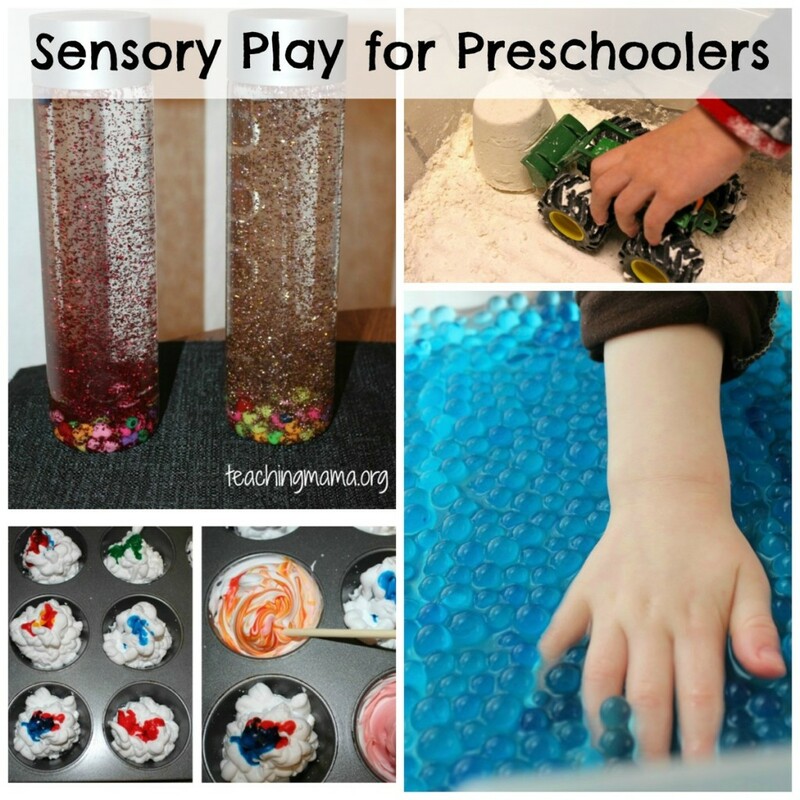 This activity goes great with the chapter I am sharing with you today from my ebook–Sensory Play for Preschoolers. Today I’m not going to share a checklist of things children need to accomplish before Kindergarten. 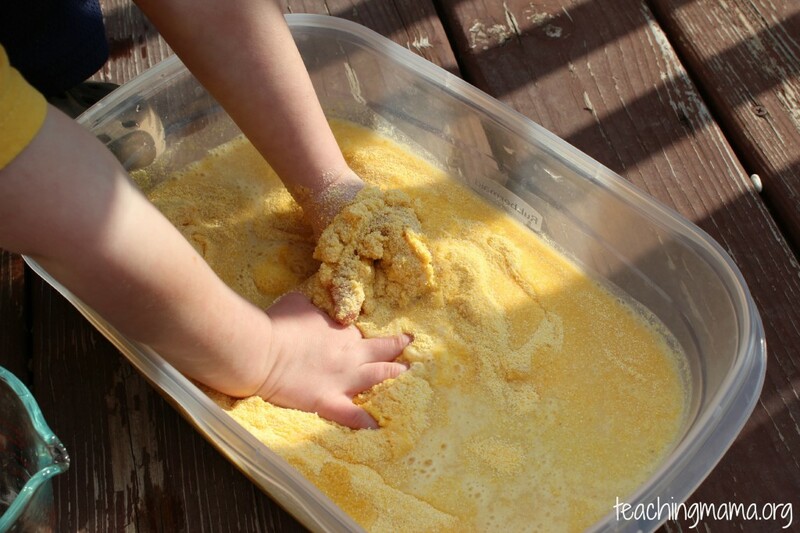 Sensory play isn’t a skill you acquire, but instead it’s a way for kids to explore the world they live in. 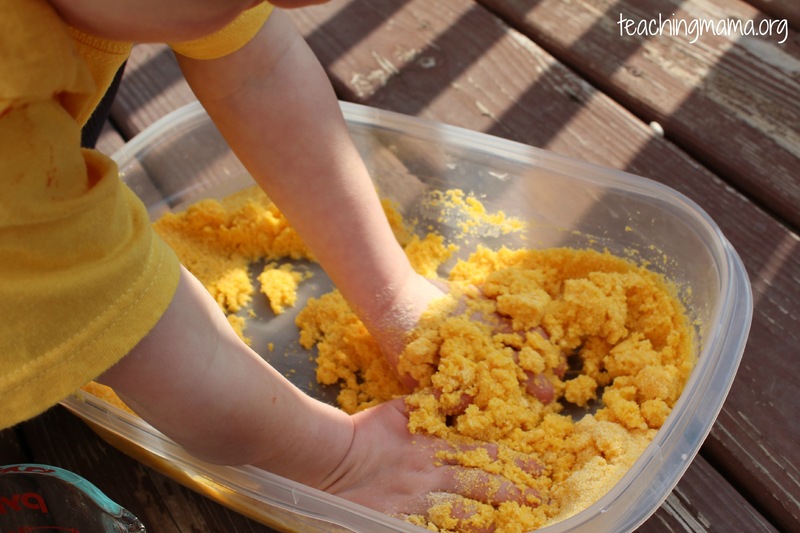 Sensory play uses the five senses: seeing, hearing, feeling, tasting, and smelling. Starting as babies, kids learn about the world around them using their senses. It’s a very natural way to learn. As children grow, children’s senses are their most familiar way to explore and process new information. Research shows that sensory play builds nerve connections in the brain’s pathways, which helps children complete more complex learning tasks. 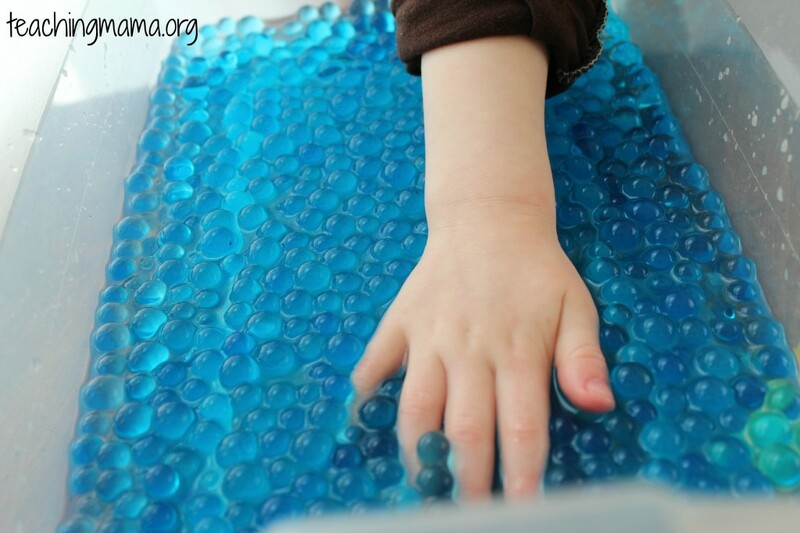 I also love that these activities teach children sensory attributes, such as hot & cold or smooth & rough. 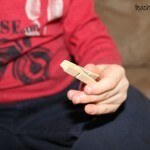 Lastly, these activities are great for calming an anxious or frustrated child. So what are some sensory activities? 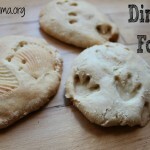 If you’ve been reading my blog for any length of time, you’ll notice we do a lot of sensory activities. 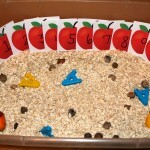 They are fun, engaging activities that focus on the senses. 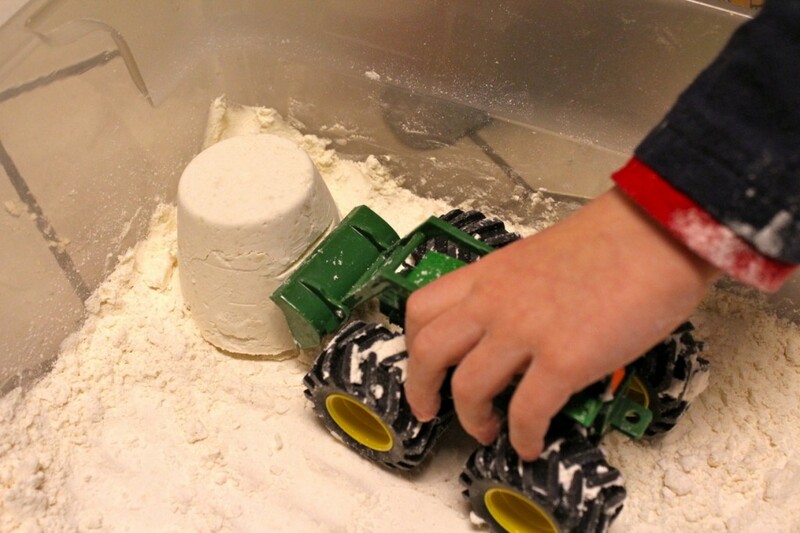 A sensory activity could be a bin full of dry beans with toys to dig and find. 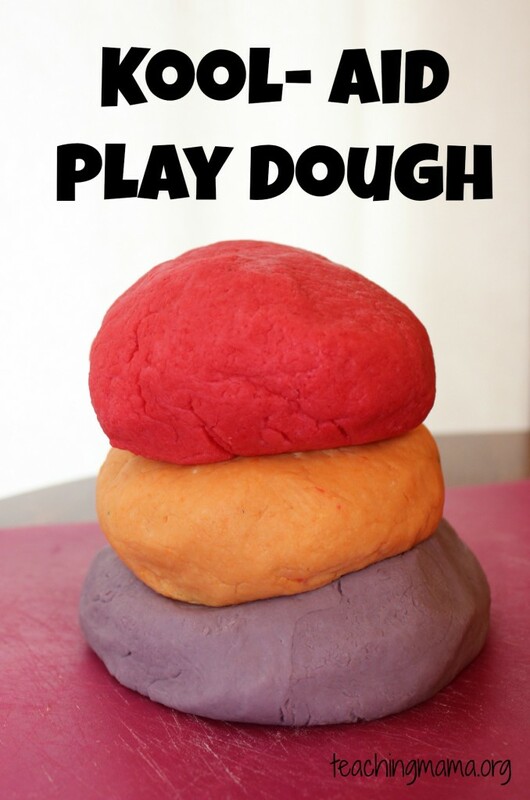 Or it could be simply playing with play dough. Below are a few of our absolute favorite sensory activities! 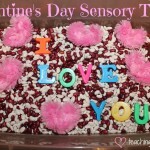 Which sensory activity do you love? 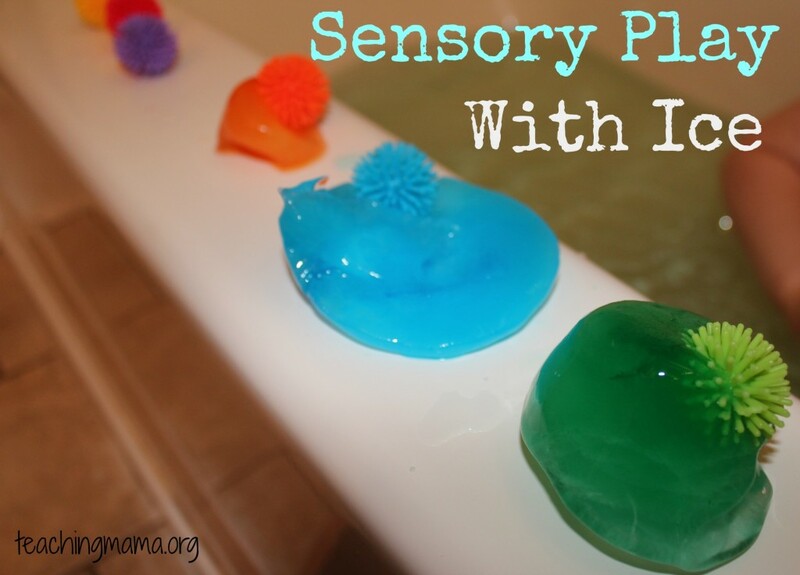 Is there a sensory activity you think we should try? I would love to hear from you! This blog post is part of a series on how to successfully teach your preschooler at home that will be put compiled into an ebook. There are 8 components of preschool that I will be writing about: alphabet, math, writing, literacy, motor skills, art, sensory, and social development. Each Friday I will share my ideas for one subject. The published ebook will include a detailed schedule and activities to do at home. Ha-ha, that looks very familiar. 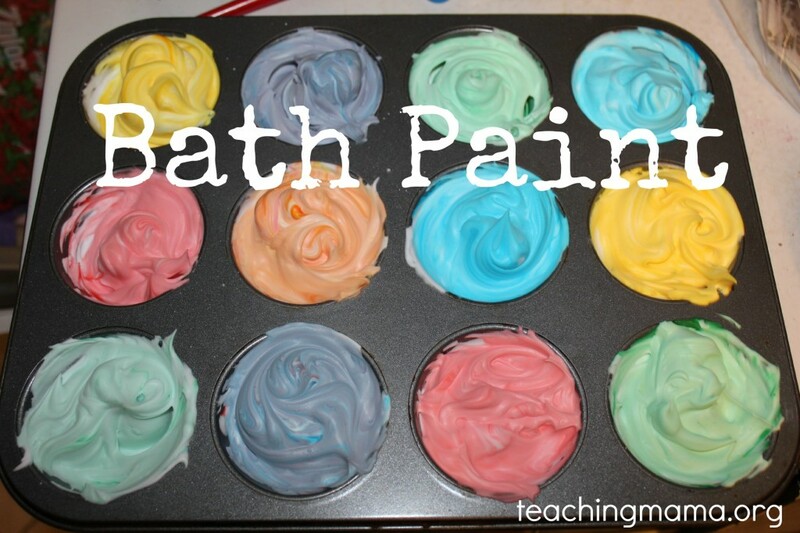 We have done this with I think you guys call it cornstarch as well which is always a joy. I think cous-cous would be fun and warm as well. Sensory play is cool. My kids are older but still love it. I got around my balloon problem by mixing gelatine with warm water and adding some Angel Delight and cooling it in the fridge. I put dinosaurs in a muffin tin with rounded bottoms to the cake spaces and spooned in some of my gloop. 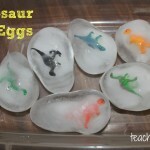 When it was set, and it set very firm, I took it out and put the dinos in upside down and added more gloop. So they are sort of egg-shaped and will taste lovely to my kids and be an interesting texture for them. I think i could have done it with warm milk but I am new to gelatine. I don’t know if you guys have Angel Delight or Angel Whip, it is a powdered solution that comes in a fair sized sachet and you add cold milk, whisk and set it in the fridge and makes a mouse that mostly tastes of chemicals if you are a grown up and tastes delightful if you are a kid. Thanks, Gina for the idea!! So glad to hear you fixed the problem with the balloons. Very creative! I don’t think we have Angel Delight/whip, but I don’t know for sure. I’ll have to see! Love your comments-have a good weekend! Looks like a fun (and delightfully messy) way to play. I love the “dinosaur swamp” idea!